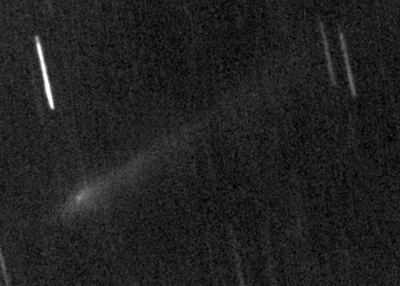 Alphonse Borrelly found this comet in Marseille, France at December,28 1904. 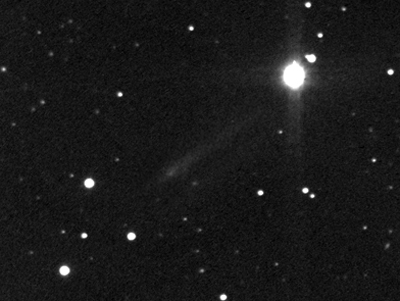 After getting the knowledge, that the long tail on our images is a sunward tail, some conclusions are possible now. The analysis of the second condensation/knot of 19P/Borrelly based on our observations. Many thanks to all participating observers! 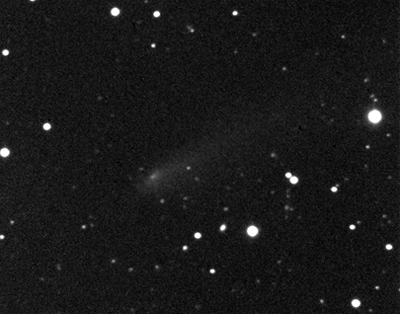 Gustavo Muler couldn't confirm a second peak on his image of April, 23. 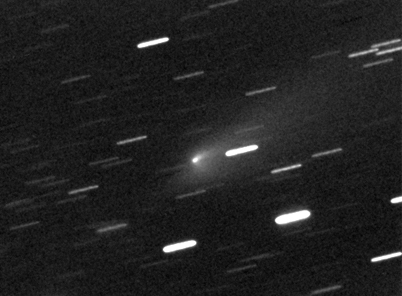 Francois Kugel (A77) remarked in the comet-ml, that the distance of the peak is decreasing to 8 arc seconds in PA 305� on his image of May, 10. 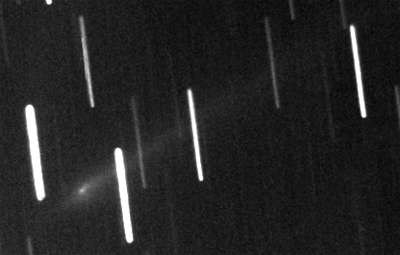 "We observe probably a reduction of the activity of the comet which s' move away." 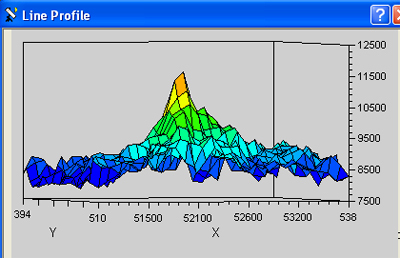 The post-analysis of all images of this year is providing an interesting course of line profiles. 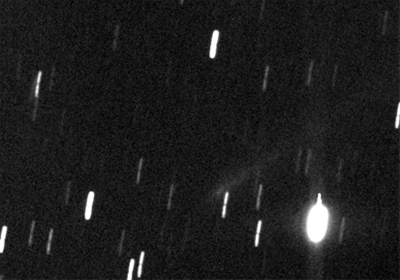 Sending officially the first three observations of Francois Kugel, the Italian amateurs and me to the CBAT at May, 15 UT21:24. 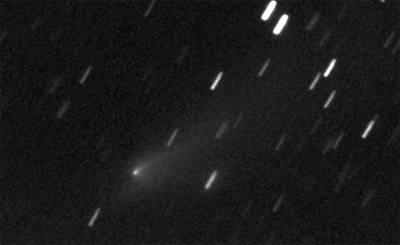 Leonid Elenin (H10) of the Tzec Maun Observatory, Mayhill (NM), confirmed in the comet-ML the existence of "condensation" at ~4 arcsec in PA 301. I think Bernhard is right - object is closer and closer to central condensation. "However, from experience gained in recent years, in my opinion, there are more fragments visible". 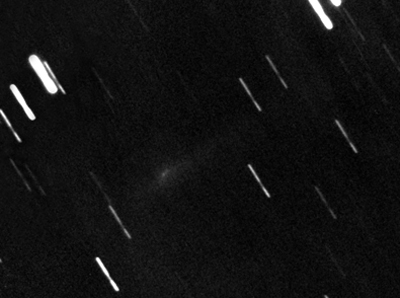 Sending officially the second email to the CBAT at May, 17 UT09:28 with additional observations. 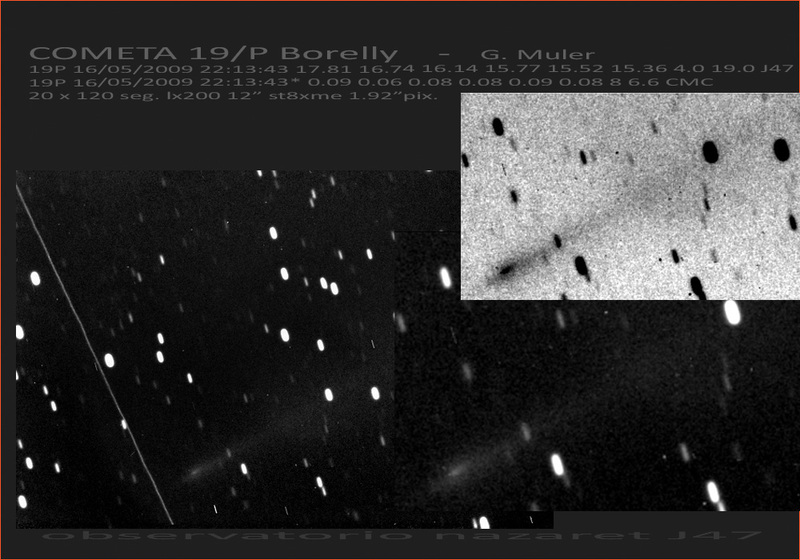 At May, 18 2009 the IAUC 9044 reported the observations of Francois Kugel, France, G. Sostero, P. Camilleri, E. Prosperi, and E. Guido of Italy and my own observation. 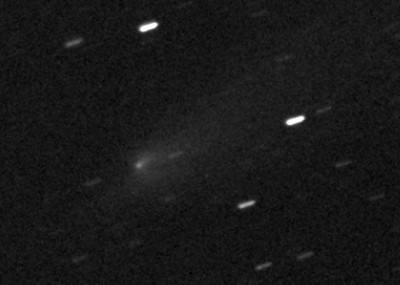 At May, 18 2009 I could take 80 images with 3 min. exp. time each. 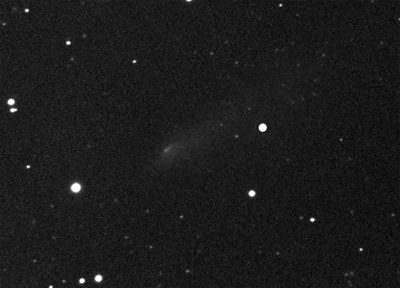 On the main tail I found some knots, two of them were good enough for astrometry. 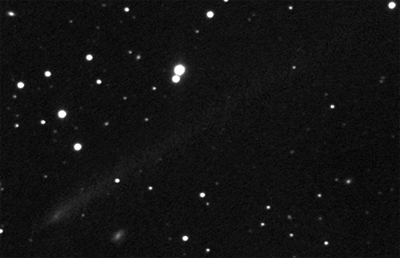 At June, 12 2009 a third knot is significant visible in about 11.25 arcsec distance to the central condensation. After coming in contact with a professional astronomer, Dr. Nalin Samarasinha of the PSI Planetary Science Institute, more light is coming into the dark. 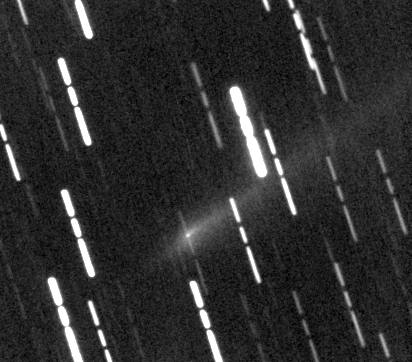 Because fragments can normally only pushed into the direction of the intrinsic tails, our observations are probably dust phenomenons. Analysis of our observations after the knowledge of the origin of the tails. 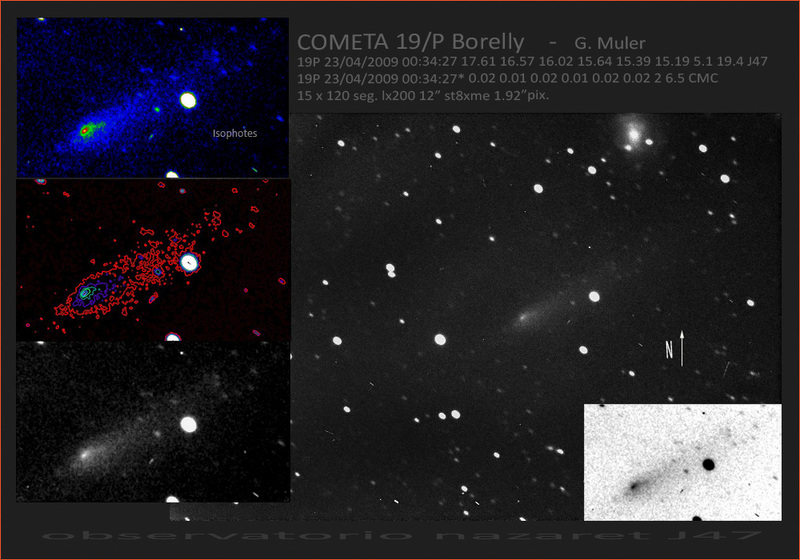 19P/Borrelly between March, 20 and June, 12 2009 All stars are removed. 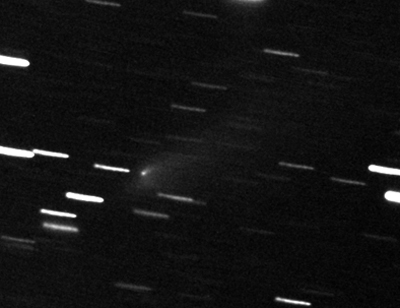 At this day the long sunward tail decreased its activity a bit. 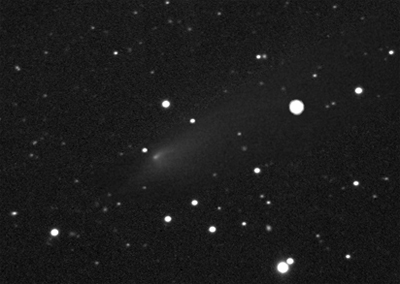 Finally we had a complete clear night at June, 12. 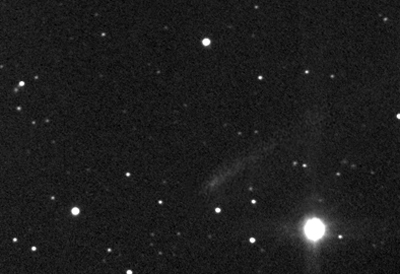 The tail is spreading over 13 arcmin. The third knot is visible pretty good. See also my image of May, 7. On the Full Moon night at June, 7 2009 my place here had good conditions for taking photos: good and deep seeing. The second knot is still visible and a third knot became significant. 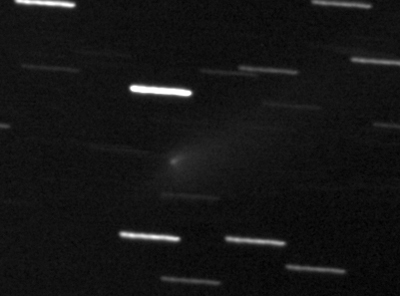 On May, 18 2009 I could finally take more images of the comet. The central condensation seems to have a double structure this day. 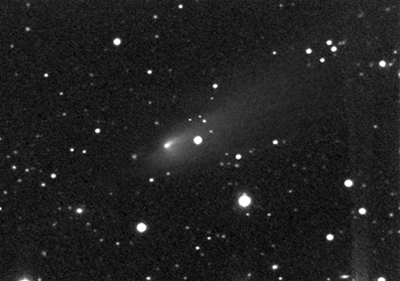 May be this is a special bright dust emission in PA 310� in 13 arc seconds distance of the central condensation. 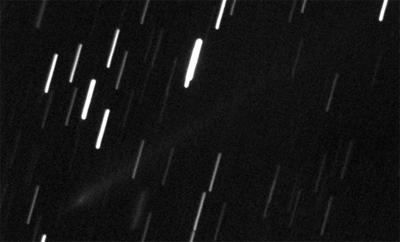 "The Beauty and the Death of a comet"
Inspite of the 94% Moon in 70� distance the complex structure of the inner and outer tails are visible quite good. I wonder how professional images would look like? 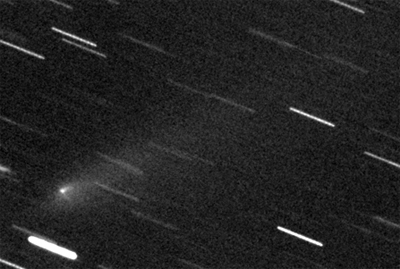 Today the comet was passed by a unknown? Galaxy Cluster. The little curved tail in PA 292� is amazing. At this morning the skies were perfect and offered best conditions for taking this photo of 19P. 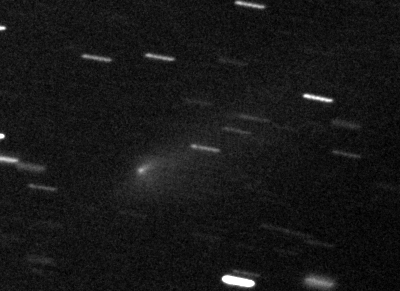 After one month the structure of the complex tail is already visible, but the magnitude of the comet is slightly decreased.